The quintessential small town, yet in the heart of the Franconia Notch region, allows you to explore nature at its fullest. I have a question about the property at 1 Hodge Hill Road Landaff NH 03585 (#4710439). I would like to schedule a visit for the property at 1 Hodge Hill Road Landaff NH 03585 (#4710439). I have a question about the property at Off Gale Chandler Landaff NH 03585 (#4713032). I would like to schedule a visit for the property at Off Gale Chandler Landaff NH 03585 (#4713032). A delightful ranch style home nestled in a country setting in Landaff on 11.2 acres. This home offers a one level design that works. Large upgraded kitchen with great natural light. Direct entry from the garage into the kitchen. As the kitchen was expanded you have space for an eat in kitchen. The laundry is concealed in a closet right in the kitchen for easy accessibility. A sliding glass door from the kitchen and the dining room accesses a large deck for family picnics or entertaining on a nice summer day. A formal dining room opens into a spacious comfortable living room with a gorgeous hearth and wood fireplace. A master suite with a private 3/4 bath and two bedrooms for guests or family. There is a full bath centrally located in the home for convenience. A full walkout basement will be great for storage or making it into a playroom for the kids. The grounds are landscaped and well maintained. This home has been very loved...please make an appointment today. I have a question about the property at 52 Rabbit Path Road Landaff NH 03585 (#4736860). I would like to schedule a visit for the property at 52 Rabbit Path Road Landaff NH 03585 (#4736860). The seller calls this home her sanctuary; she has loved living here and it's evident throughout. A private setting with a home sited on 5 acres at the top of a knoll overlooking a manicured lawn with perennial beds and fruit trees greatly enhancing the pastoral setting. Inside, a bay window to perfectly frame the glowing sunsets as you are warmed by the southwesterly exposure. Vaulted ceilings and an abundance of natural light refine an airy, uplifting environment. The home is warm, comfortable, and peaceful and has had many updates, including new kitchen, bath, hardwood flooring, all upper level lighting with brushed-nickel designs, lower level woodstove, new tiled bath and more. A turn-key home just the right size for easy living and low cost maintenance. There are two bedrooms and a full bath on the living level and one bedroom, family room, full bath,and laundry on the garden level. Enjoy the deck off the back and the privacy of your yard. You'll be living in pastoral Landaff, yet 17 miles to downtown Littleton for shopping and fine dining, and 11 miles to Woodsville for additional shopping and dining. You'll be about 27 minutes to Cannon Mountain for skiing and hiking, and less than 15 minutes to Sugar Hill for golf. A home like this works for the busy lifestyle or four season vacation. Come home and turn down the noise and tune into tranquility. I have a question about the property at 75 Jockey Hill Road Landaff NH 03585 (#4724843). I would like to schedule a visit for the property at 75 Jockey Hill Road Landaff NH 03585 (#4724843). I have a question about the property at 24 Gale Chandler Road Landaff NH 03585 (#4736061). I would like to schedule a visit for the property at 24 Gale Chandler Road Landaff NH 03585 (#4736061). 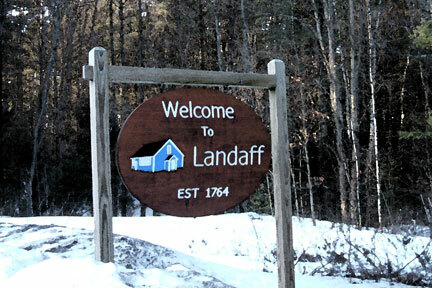 50.78+/-Acres of land in the sweet town of Landaff NH. Larger parcels are becoming a rarity-this has beautiful undulations and topography, comprised of pasture area from years past, frontage on the Scotland Brook, to the height of the land for beautiful local views and pretty woods with wildlife being plentiful. The land almost speaks to you, one foot in front of the other, it takes you further into your quiet self, getting lost in the stillness of the woods with the canopy of the trees letting the blue sky and daylight filter from above. Follow the animal tracks and let yourself go, exploring as they did. Snowmobile trails just out your back door-you can ride for miles! Pearl Lake is 61 acres, just down the road, a quiet sport lake where there is public access for canoe, kayaking and some of the best fishing! Equal distance the other way is the Audubon Society, a wonderful trail system and viewing area.The White Mountain National Forest sits at the Southern part of town and Franconia Notch is nearby. Sited nicely between I-93 and I-91 you'll find Littleton for larger services and Dartmouth, Hanover a short drive too. If you are looking for a place to settle where the community is warm and welcoming yet respects one's privacy, come nestle in to this lovely town with population hovering around 500. There is a volunteer fire dept., the quaint Blue School for children, a warm community-small town with strong spirit! Property being transferred in Current Use Tax Status. I have a question about the property at Pearl Lake Landaff NH 03585 (#4742203). I would like to schedule a visit for the property at Pearl Lake Landaff NH 03585 (#4742203). 118 acres!! One of the largest parcels on local market. This listing consists of 2 adjoining lots, a 30.26-acre lot with frontage on Moses Clark Road and an 87.8 acre lot with a Right-Of-Way to Gale Chandler Rd. Recently logged and ready for building, hiking camping, hunting, snowmobiling, ATVing, or otherwise enjoying. Close to Littleton, Woodsville, Bretton Woods, Cannon Mtn and other north country delights. Stake this big north country claim and enjoy it til you're ready to build / move up. I have a question about the property at Moses Clark Rd Landaff NH 03585 (#4681367). I would like to schedule a visit for the property at Moses Clark Rd Landaff NH 03585 (#4681367). I have a question about the property at 69 Chandler Pond Road Landaff NH 03585 (#4745792). I would like to schedule a visit for the property at 69 Chandler Pond Road Landaff NH 03585 (#4745792). I have a question about the property at Jockey Hill Landaff NH 03585 (#4729693). I would like to schedule a visit for the property at Jockey Hill Landaff NH 03585 (#4729693). I have a question about the property at 1 Gale Chandler Landaff NH 03585 (#4668744). I would like to schedule a visit for the property at 1 Gale Chandler Landaff NH 03585 (#4668744).